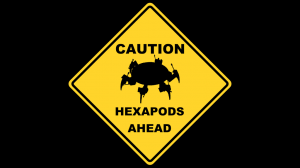 Hexapod conference? how to plan a conference budget? I applied to the deFlorez Fund for Humor at MIT. The application deadline for grants over $1000 was due at midnight, and at around 10pm I decided to apply for funds for a hexapod conference. I should hear back by the end of MIT spring break (the 30th). Funding decisions will be made approximately two weeks following the application deadline. If an award is made, disbursement of the award will take place once sufficient funds have been secured to hold the event. Let’s face it. An MIT student’s personal life is their work life. Too few are prepared to find the humor in this, or prepared to acknowledge such humor exists. This conference epitomizes silliness in research, silliness in personal projects, and silliness in how we envision the technical world around us evolving. Moreover, it highlights the importance of this silliness in a student’s daily life. The concept of a hexapod, the concept of investing time and resources into something that, in the end, probably won’t change the world (unless you build it several stories tall and figure out how to give it a Godzilla complex), resonates with many an MIT student. This conference is to help them both acknowledge and celebrate all of the things in their research, classes, personal lives (for those that persist in imagining they have one, in any case), and business which have not gone the direction they anticipated, or which did not provide as much of an impactful result as they were envisioning. I would try and explain the humor of wrapping all of this up in a metaphor of hexapods and then go on to wax eloquently (or perhaps just wax) about the philosophical implications of how a project which has gone nowhere can still impart necessary skills and life lessons, but that’d be spoiling the fun of it. You should come see for yourself the wonders of dancing hexapods, the hours of toil put into this utterly silly contraption, and experience your nervous laughter as this parody evolves into genuine humor acknowledging all of the ridiculous things humans do which, somehow, make the world a better place. We’re just not sure how yet. Well, anyway. How do you plan a conference? The field may be a new one, and still lack a clear identity. A conference could bring together the people who are building it, and help to define it. The field may not be cohesive. People in it may not know one another, may disagree on methods or other issues, or may simply not realize how many others have similar interests. A conference could bring them together and create networks that would expand and improve the work. The mission of this conference would be to promote silliness at MIT. An extracurricular undergraduate reading group I led last year. The rapid fabrication hexapods we made during the last reading group session. Hexapod Demonstration II from Katy Gero on Vimeo.